Smartworld, a next-generation ICT provider in the Middle East that has been entrusted with the responsibility to provision the ICT network in Dubai World Central, or DWC, has achieved a milestone with the implementation of a gigabit passive optical network, or GPON, network at DWC. The launch will put DWC, the world’s first purpose-built aerotropolis and strategic initiative of the Government of Dubai, into the league of prestigious gigabit capable precincts of the world and provide next-generation network capabilities to ICT users at DWC. “Following the success of this project, DWC will continue to work closely and take advantage of Smartworld’s specialised expertise,” said Rashed Bu Qara’a, chief operating officer of Dubai Aviation City Corporation. “The next-generation network unlocks more exciting possibilities for business enterprises operating at DWC, giving them unprecedented networking and communication capabilities,” Smartworld chief executive officer Reyadh Ayesh added. Dubai: The city of superlatives has done it again with JW Marriott Marquis Hotel, Dubai, claiming the world’s tallest hotel title, the latest addition to Dubai’s growing list of world records. “We are excited and delighted to be officially recognised as the world’s tallest hotel. Dubai is a city of superlatives and the JW Marriott Marquis is an outstanding addition its iconic skyline,” said Rupprecht Queitsch, general manager of JW Marriott Marquis Hotel. Located in the heart of Business Bay, the 355-metre JW Marriott Marquis Hotel was recently officially recognised by the Guinness World Record as the world’s tallest hotel. The iconic five-star hotel boasts of a height that’s almost half or 43 per cent of the height of Burj Khalifa. The world’s tallest hotel title was previously held by the 333-metre tall Rose Rayhaan by Rotana on Shaikh Zayed Road, which opened in January 2010. Dubai holds a number of Guinness World Records including the tallest building — the Burj Khalifa; the tallest residential building — Princess Tower; the largest shopping centre The Dubai Mall; the largest indoor ski-resort — Ski Dubai; to name a few. Currently, JW Marriott Marquis Hotel ranks 28th in the world’s top 200 tallest buildings, and the sixth tallest building in Dubai, according to Emporis, a global database for building and construction information. The 77-floor twin towers opened its first tower to guests last month. The hotel’s grand opening is scheduled in February 2013. His Highness Shaikh Mohammad Bin Rashid Al Maktoum, Vice-President and Prime Minister of the UAE and Ruler of Dubai, in November ordered the implementation of the second phase of the project that is scheduled to be completed by 2014. The hotel has 804 guest rooms with panoramic views in each tower, 14 restaurants, bars and lounges. It features more than 8,000 square metres of indoor and outdoor event space which includes two ballrooms. “It’s sort of a small city within itself. Any business traveller can find everything he needs within the hotel itself,” Ashok Korgaonkar, JW Marriott Marquis Hotel Dubai’s leading architect, told Gulf News. Korgaonkar said that when they designed the hotel in 2005, the primary goal was not just to come up with a good design but also to make it functional. “We wanted the design to stand out in comparison to the surrounding buildings but we didn’t want purely aesthetics but also functionality. So the structure is basically the contemporary version of the trunk of the date palm tree which is part and parcel of the life in Arabian countries,” Korgaonkar said. A group of Emirati youths has made a model of Abu Dhabi’s historic Al Maqta Fort using empty aluminium cans, breaking the previous Guinness record made by Japanese earlier in the year. To enter their sculpture into the Guinness World Records, 30 trainees working at Mubadala and Dubal-owned smelter Emirates Aluminium (Emal) in Taweelah, used 46,566 empty cans -against 35,679 cans used by Japanese in September- to make their real-sized sculpture. They spent 50.5 hours to build the sculpture. The cans were produced from the Aluminum smeltered at Emal in Abu Dhabi. The record breaking model, built on the beaches of Emal plant in Taweelah near Dubai, is 5.67 metres tall, with a base diametre of 3.99 metres and top diametre of 2.06 metres. “The model is 1/3rd of the actual size of the fort,” Al Falasi said. He said that he and his friends put in real hard work for obtaining the drawings of Maqta Fort from the authorities and using computer animation and models in order to construct it can by can. Hundreds of family members of Emal staff, who were present on the occasion, cheered the team with excitement when the officials from the Guinness World Records announced the successful entry of the record. 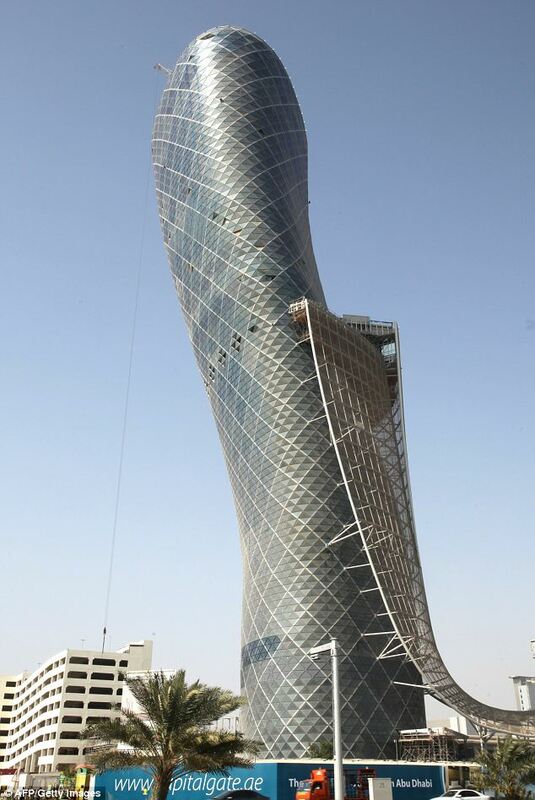 Lean machine: The Capital Gate tower in Abu Dhabi tilts at 18 degrees using staggered flooring from the 12th floor of the 35-storey building. At 348 metres, The Torch in Dubai Marina has won formal recognition as the world’s tallest residential tower. Dubai has got strong representation in the Emporis Standards Committee’s list of the world’s tallest residential towers.